Brinjal/Eggplant/Aubergine known also as ‘Baingan’ in Hindi is of Indian origin. 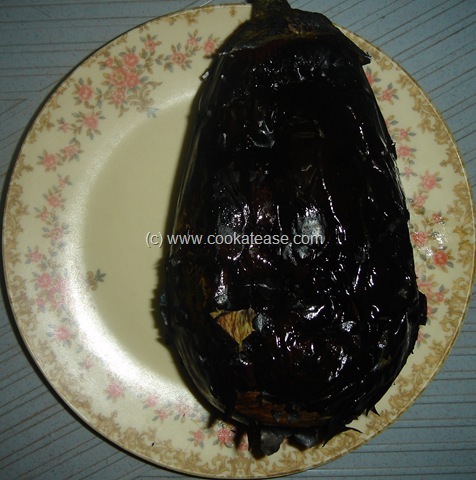 Brinjal is available throughout the year and is used in almost all indian cuisines. 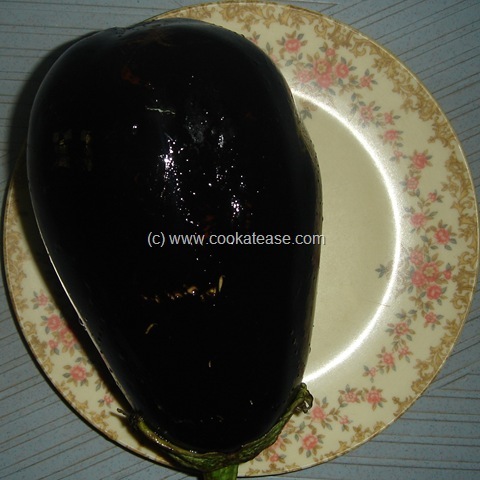 We can say that brinjal is the ‘king of vegetables’. 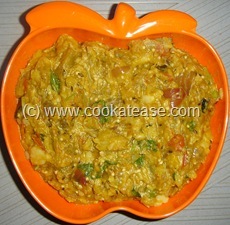 Such a wonderful vegetable can be added in any curry. 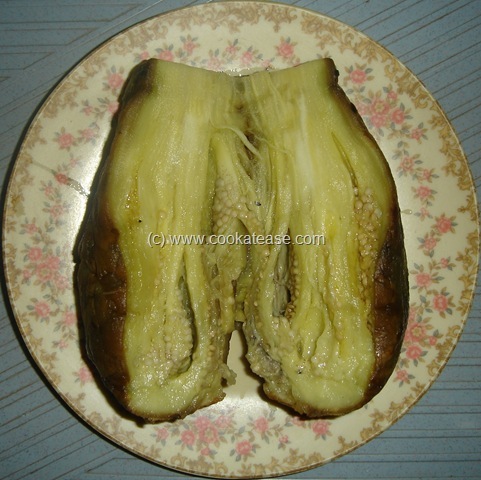 Brinjal is available in different shape, size and colour. 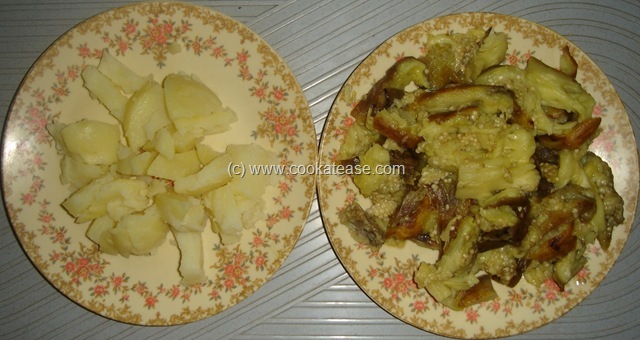 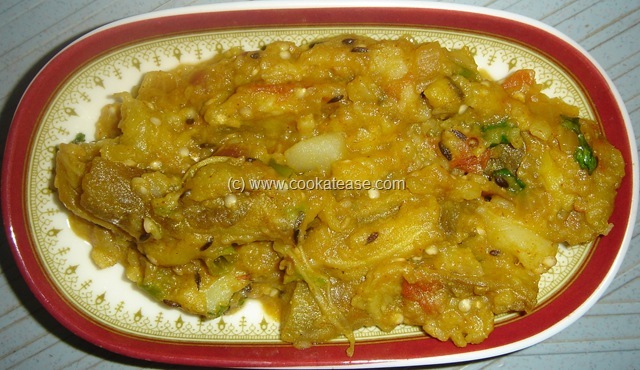 Variety of dishes can be made from brinjal. Baingan Bartha is also one among them. Baingan Bartha is a well known north Indian dish and is getting popular in south India also. 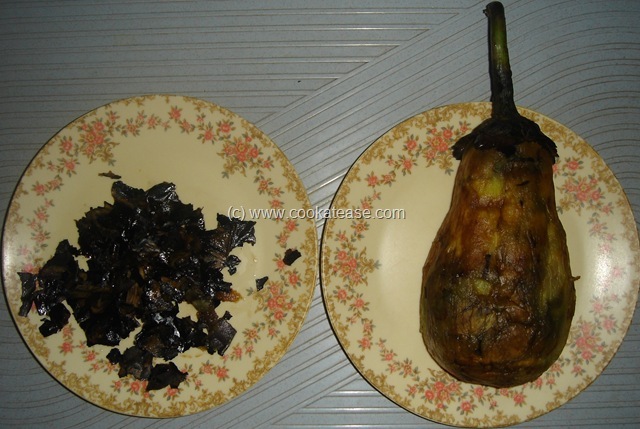 In this recipe, Brinjal is roasted until the skin is charred, so that the pulp is removed easily and added with different spices. 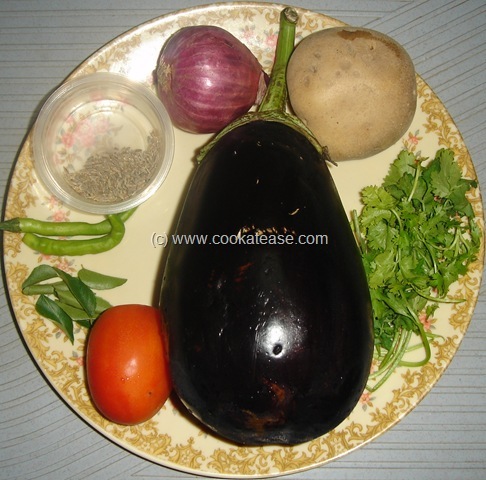 Wash, wipe, apply few drops of oil on the surface of brinjal. 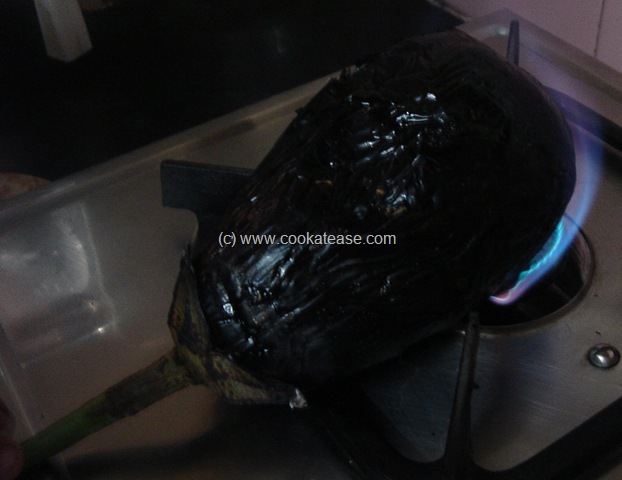 Keep brinjal on direct low flame; rotate brinjal all sides slowly and uniformly to cook it in flame and skin will start burning all sides; insert a fork on the surface of brinjal and check whether the brinjal is cooked or not; in cooked parts, fork goes inside easily if not keep in flame for some more time. 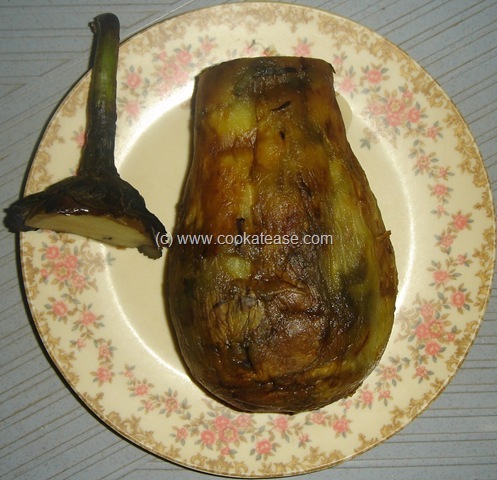 When done cool the brinjal; peel and remove the burned skin; cut and remove the stem; wash it and mash it; meanwhile boil potato, peel and cut. 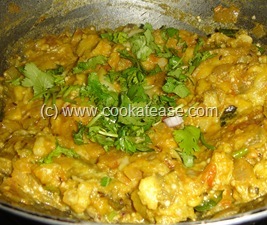 Chop onion, tomato, green chilli and curry leaves; heat a pan with oil, do the seasoning; add chopped onion, chopped green chilli and curry leaves; fry till onion is transparent, then add chopped tomato and fry till tomato is soft. 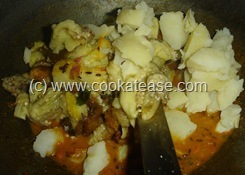 Add red chilli powder, coriander powder, turmeric powder and salt, mix well, fry for few seconds; add half cup of water, bring to boil, add mashed brinjal, boiled and cut potato pieces; mix and cook for few seconds, so that all mix together and is thick. 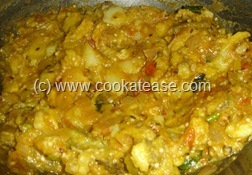 Baingan bartha is ready and roasting in flame gives wonderful taste to bartha. 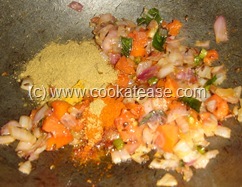 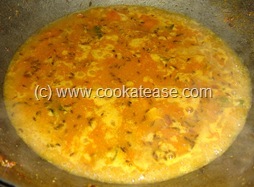 ; garnish with coriander; serve hot with Roti or Rice. 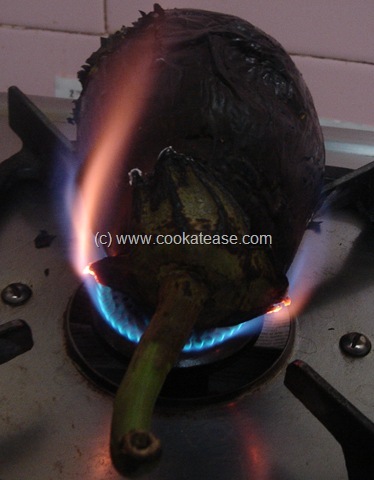 Select brinjal with a long stem and without holes; long stem is useful to hold it while roasting on the flame. While roasting on the flame, be alert to avoid burning your fingers. This post is part of the “Durga Puja Food Festival” organised by Cook Like a Bong.